What can one man accomplish, even a great man and brilliant scientist? Although every town in France has a street named for Louis Pasteur, was he alone able to stop people from spitting, persuade them to dig drains, influence them to undergo vaccination? Pasteur’s success depended upon a whole network of forces, including the public hygiene movement, the medical profession (both military physicians and private practitioners), and colonial interests. It is the operation of these forces, in combination with the talent of Pasteur, that Bruno Latour sets before us as a prime example of science in action. Latour argues that the triumph of the biologist and his methodology must be understood within the particular historical convergence of competing social forces and conflicting interests. Yet Pasteur was not the only scientist working on the relationships of microbes and disease. How was he able to galvanize the other forces to support his own research? 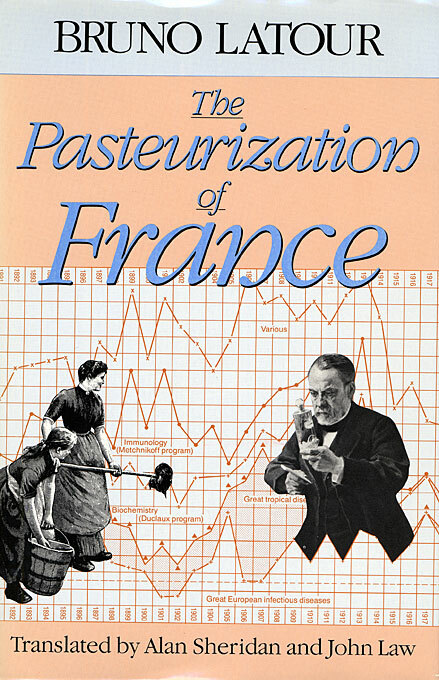 Latour shows Pasteur’s efforts to win over the French public—the farmers, industrialists, politicians, and much of the scientific establishment. Instead of reducing science to a given social environment, Latour tries to show the simultaneous building of a society and its scientific facts. The first section of the book, which retells the story of Pasteur, is a vivid description of an approach to science whose theoretical implications go far beyond a particular case study. In the second part of the book, “Irreductions,” Latour sets out his notion of the dynamics of conflict and interaction, of the “relation of forces.” Latour’s method of analysis cuts across and through the boundaries of the established disciplines of sociology, history, and the philosophy of science, to reveal how it is possible not to make the distinction between reason and force. Instead of leading to sociological reductionism, this method leads to an unexpected irreductionism.